Stan Weinstein’s book ‘Secrets for Profiting in Bull and Bear Markets’ is without doubt one of the classics books traders read. If you did not read it yet, we can certainly advise it. We have recently added (more) support for Weinstein’s methods in both the charts and the screener. This article will introduce these new concepts. 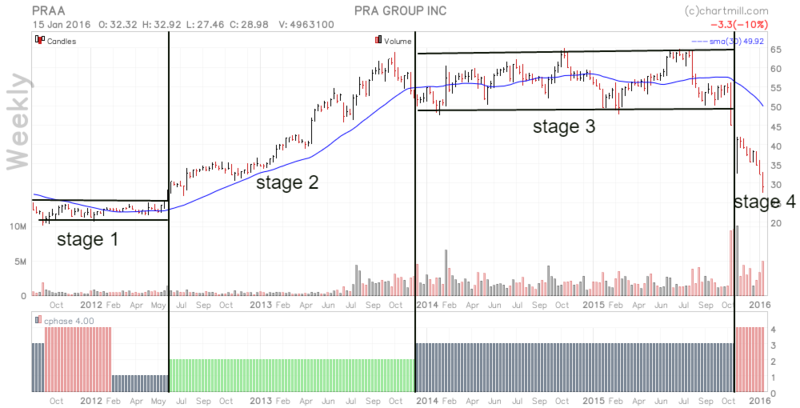 These stages basically classify the different periods in the lifetime of a stock. An important thing to understand is that Weinstein uses weekly charts and identifies the current stage based on the direction on the 30 week moving average. Stage 1 is similar to Stage 3. Both are basing stages and the true stage level can only be identified after the next phase starts. After a stage 2 (Advancing) a basing period can occur. This can be both a ‘Stage 3 distribution’ period as an ‘Intermediate Stage 1 Accumulation’ period. Or in other words: typically an advancing stage will have intermediate basing stages after which the advance continues. For our indicator, we will define the stage depending on the previous stage. A Stage 1 always follows a Stage 4 decline and a Stage 3 always follows a stage 2 advance. (Even when after the fact it turns out to be an intermediate stage). Real life stocks do not always enter a long lasting single stage. Often you will see the indicator switch stages for shorter periods. The 30 week simple moving average. The ‘Chartmill Weinstein Stage Indicator’. The ‘Chartmill Weinstein Stage Length Indicator’. Mansfield Relative Strength. This indicator shows how the stock’s relative strength is improving or decreasing compared to the general market. This is also a key indicator used in Weinstein’s work. See here for more info. Chartmill channels. These are mostly useful in basing stages to indicate the boundaries of the base. Also check out this article on Weinstein setups and chartmill channels. Find a link to a chart with these indicators here. You can easily save these settings if you want to reuse them later. The screen ‘Weekly chartmill Channel breakouts‘ was already one of our more popular screens and is also dedicated to finding long breakouts on weekly charts from a basing stage. The new filters allow you to select the stage. Additionally you can also filter on a minimum stage length. We have added a new screen to our shared screen list that looks for stage 1 stocks that are in this stage for over 30 weeks. Check it out here.